You can download the PDF for a paper that appeared in the ACM SIGMOD 2002 proceedings describing the initial motivation and design of the SkyServer Website. For convenience, the paper contents are also listed below. 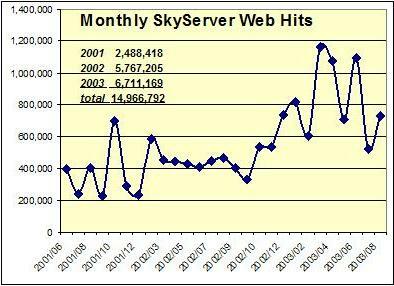 You may also see the SkyServer Traffic Report - The First Five Years. The first two years of SDSS data are now public. The raw data is over 2.5 terabytes, and the catalog size is about 800GB containing over 80 million objects and 180,000 spectra. You can access the public catalogs via the SkyServer on the Internet or you may get a private copy of the data. 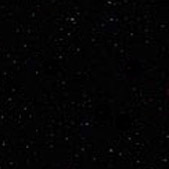 The web server supports both professional astronomers and educational access. This design derives from the TerraServer [Barclay] – both the structured data and the images are all stored in the SQL database. A 5-level image pyramid of the frames is precomputed, allowing users to see an overview of the sky, and then zoom into specific areas for a close-up view of a particular object. The most challenging aspect of the web site design has been supporting a rich user interface for many different browsers. Supporting Netscape Navigator™, Mozilla™, and Microsoft Internet Explorer™ is a challenge – especially when the many Windows™, Macintosh™, and UNIX™ variants are considered. The SkyServer does not download applets to the clients (except for sdssQA), but it does use both cascading style sheets and dynamic HTML. It is an ongoing struggle to support the browsers as they evolve. Figure 1: The SkyServer web interface provides many different ways to look at the SDSS data. The simplest is “famous places” which is just a gallery of beautiful images. More sophisticated users can navigate to find the images and the data for a particular celestial object. There are a variety of query interfaces and also links to the online literature about objects through other public databases. Figure 2: The navigation interface allows you to enter a point on the sky to view the “cutout” for that spot. Then you can zoom in to view objects close up, or out to look at the big picture. One can select various overlays to provide a convenient graphical representation of various spatial objects (fields, plates, tiles, stripes, masks). By pointing to an object one can get a summary of its attributes from the database, and one can also explore all the information centered on a given photometric object. The SkyServer is just one of the ways to access the SDSS data. In addition, the raw SDSS pixel-level files are available from Science Archive Server (SAS). Figure 5a: In its first 4 months the SkyServer processed about 2 million page hits, about ½ a million pages and about thirty thousand sessions. The SkyServer is primarily administered from Johns Hopkins and San Francisco using the Windows™ remote windows system (Terminal Services Client) feature. For the first two years, the Fermilab staff managed the physical hardware, the network, and site security, with a mirror server at Johns Hopkins for incremental development and testing. As of August 2003 - the administration and primary site have now moved to Johns Hopkins University and a mirror site will be hosted at Fermilab. Additional mirror sites are also being hosted in Germany (Max-Planck Institute, Garching), Japan and India (IUCAA). Originally, the SDSS developed the entire database on ObjectivityDB™ [SDSS-Science Archive]. The designers used sub-classes extensively: for example the PhotoObject has Star and Galaxy subclasses. ObjectivityDB supports arrays so the 5-colors naturally mapped to vectors of 5 values. Connections to parents, children, spectra, and to other surveys were represented as object references. Translating the object oriented design into a relational schema was not straightforward; but we wanted to preserve as much of the original design as possible in order to preserve the existing knowledge, skills, and documentation. The SkyServer initially took a simple approach to database design – and since that worked, we stopped there. The design counts on the SQL storage engine and query optimizer to make all the intelligent decisions about data layout and data access. The total amount of data in the two databases is 818 GB, and the total number of rows exceeds 3.4 billion. Figure 7b: The schema for photographic objects. Observations are processed in fields. Each field in turn contains many objects. Objects have an image and a profile array, giving the brightness in concentric rings around the object. Correlations to other surveys (Rosat, First, USNO, …). For objects observed multiple times a Match table is created. Closeby neighbors are precomputed. are recorded. The result is a snow-flake schema with the PhotoObjAll table in the center other tables clustered about it (Figure 7). The 80 million PhotoObj records each have about 470 attributes describing the object – about 2KB per record. The Field table describes the processing that was used for all objects in that field, in all frames. The other tables connect the photoObj to literals (e.g. flags & fPhotoFlags('primary')), or connect the object to objects in other surveys. One table, neighbors, is computed after the data is loaded. For every object the neighbors table contains a list of all other objects within 1/2 arcminute of the object (typically 10 objects). This speeds proximity searches. HTM partitions the sphere into the 8 faces of an octahedron. It then hierarchically decomposes each face with a recursive sequence of triangles – so each level of the recursion divides each triangle into 4 sub-triangles (Figure 8a and 8b). SDSS uses a 20-deep HTM so that the individual triangles are less than 0.1 arcseconds on a side. So, the HTM ID for a point very near the north pole (in galactic coordinates) would be something like 3,0,….,0. 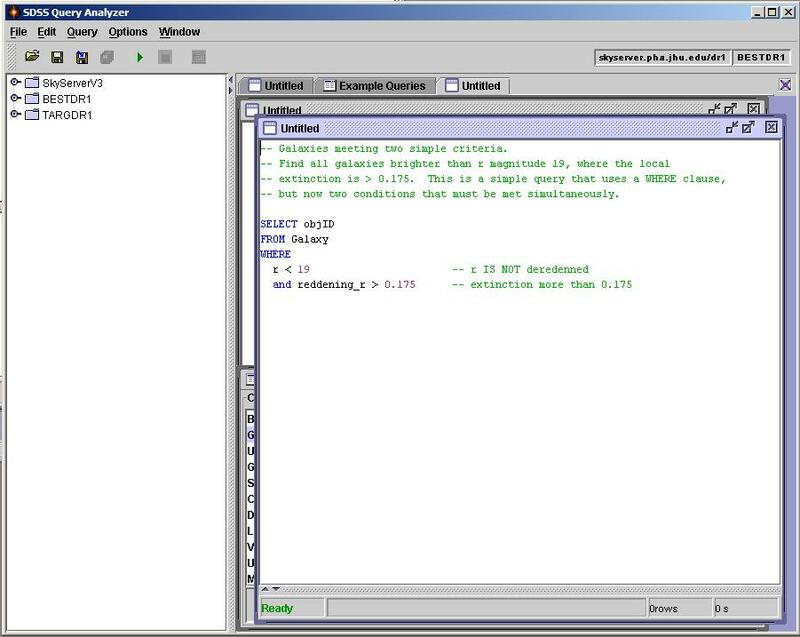 There are basic routines to convert between (ra,dec) and HTM coordinates. Figure 8b: A Hierarchical Triangular Mesh (HTM) recursively assigns a number to each point on the sphere. Most spatial queries use the HTM index to limit searches to a small set of triangles. An HTM index is built as an extension of SQL Server’s B-trees. A 1% subset of the SkyServer database (about 1.3 GB SQL Server database) can fit (cpompressed) on a CD or be downloaded over the web. This includes the web site and all the photo and spectrographic objects in a 6º square of the sky. This personal SkyServer fits on laptops and desktops. It is useful for experimenting with queries, for developing the web site, and for giving demos. Essentially, any classroom can have a mini-SkyServer per student.